In the last decade the world has witnessed bubbles galore: in industrial commodities and rare earths; in U.S. farmland and Chinese garlic bulbs; in fine or not-so-fine art, depending on your taste; in vintage cars and fancy handbags; in “super-city” properties from London to Hong Kong, and across China’s tier-one cities; in long-dated government bonds; in listed and unlisted technology stocks; and in the broader American stock market. One of my favorite financial writers, Edward Chancellor, has posted this article over at ThinkMarkets, an NYU economic blog. Chancellor is the author of Devil Take The Hindmost: A History Of Financial Speculation, by far the most literate book ever written on financial manias. Yes, Chancellor says, the US is a bubble economy, an argument Jeff Snider and I have been making for quite a while now. And no, the slow pace of this expansion does not invalidate that argument but rather, as Chancellor shows, reinforces the argument. Indeed, it is the “hair of the dog” policies implemented by the world’s Central Banks that ensured the slow recovery. With a slew of fine turns of phrase – describing bitcoin as digital fairy dust is my favorite – this article is a must read. Smith explains why: “the ordinary price of land … depends everywhere upon the ordinary market rate of interest.” That’s because the interest rate discounts and places a capital value on future income. All the great speculative bubbles in the past – from the tulip mania of the 1630s through to the global credit bonanza of the last decade, have occurred at times when interest rates were abnormally low. The trouble is that after the Lehman Brothers collapse, central bankers refused to accept this fact. The position of Ben Bernanke’s Federal Reserve was that the real-estate bubble was caused by lax regulation rather than his predecessor Alan Greenspan’s easy money. If this were true, then taking short-term rates down to their lowest level in history – to zero in the United States and negative in Europe and Japan – was sensible. But if Smith was correct, then monetary policy in the wake of Lehman’s bust was a case of the hair of the dog. 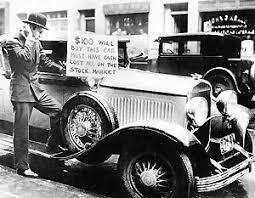 Previous articleDo Spectacular Earnings Justify Spectacular US Stock Prices?